Explanation: Two unusual spots are on the move near the famous Pleiades star cluster. Shifting only a small amount per night, these spots are actually comets in our nearby Solar System that by chance wandered into the field of the light-years distant stars. On the far left is comet C/2017 O1 ASAS-SN, a multi-kilometer block of evaporating ice sporting a bright coma of surrounding gas dominated by green-glowing carbon. Comet ASAS-SN1 shows a slight tail to its lower right. Near the frame center is comet C/2015 ER61 PanSTARRS, also a giant block of evaporating ice, but sporting a rather long tail to its right. 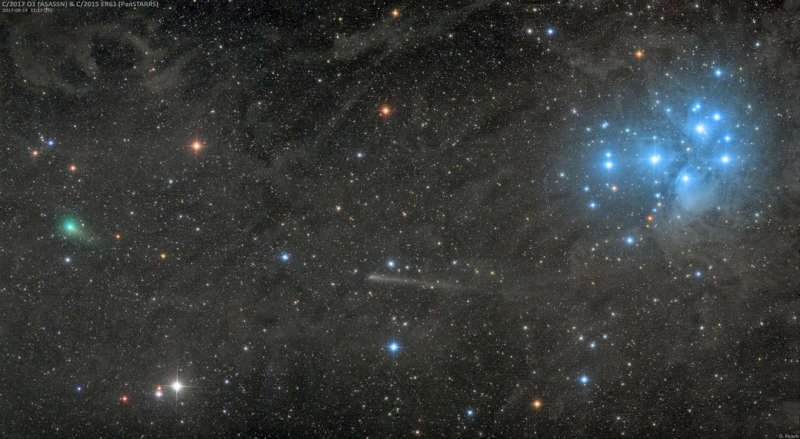 On the upper right is the Pleiades, an open cluster dominated by bright blue stars illuminating nearby reflecting dust. This exposure, taken about two weeks ago, is so deep that the filamentary interstellar dust can be traced across the entire field. The Pleiades is visible to the unaided eye, but it should require binoculars to see the comets.